Formerly Custom Lighting Fixtures, Inc.
MODEL 204 - MOST POPULAR! 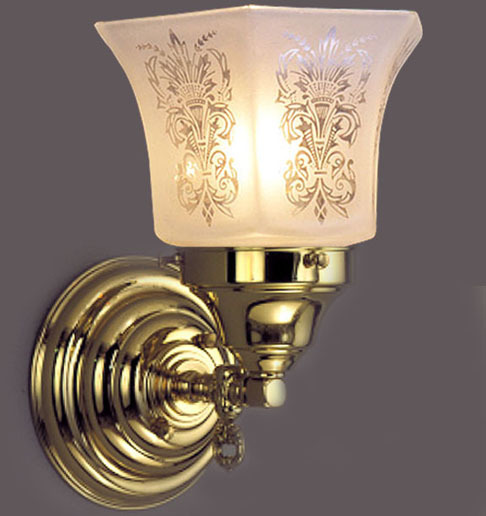 An excellent light for hallways bedrooms or flanking your dining room table. Pictured with this frosted hexagonal acid etched glass shade and gorgeous beehive canopy. Beautiful detail down to the realistic gas key. Free mounting hardware included. Can be mounted with glass facing up or down during installation. Shown in Polished Brass. Available in different Metal Finishes, different Glass, Back Plate, multiple arms and many other Custom Options. Width 7 In. / Projection 9 In. / Depth 10 In. Price and Measurements are for fixture configuration as shown and in the metal color shown. Glass shades are not included. Speak with a designer who can help you choose and customize your selections.